A’Tempting’ Tuesday: Ooey, Gooey and Good! This recipe ranks at the top of my list of yummy desserts. The ingredients just go together. Remember the old peanut butter cup commercials? (Here’s ONE for a refresher) … You know “you got peanut butter in my chocolate. You got chocolate in my peanut butter!” What results is a perfect match. This pie is kind of like that. First you have pecan pie — amazing on its own. The, you add chocolate. You can’t get any better than that. In my opinion you can cover most anything with chocolate and it tastes great. Pair it with something that is already good and you can’t go wrong. I’ve had several different types of chocolate pecan pie, the main two being a pecan pie with a layer of chocolate on top, or a pie with the chocolate mixed in. I prefer the latter. It’s just ooey, gooey and good! 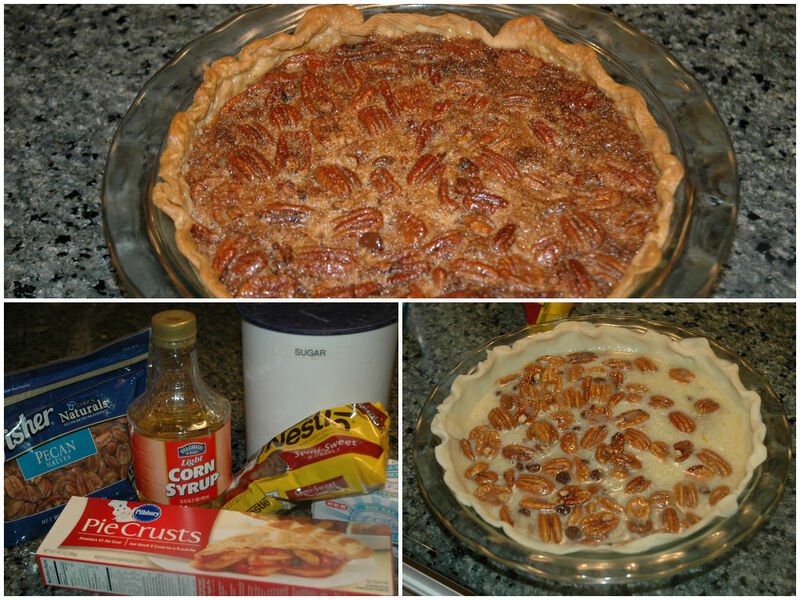 This recipe is a pecan pie recipe I’ve used for years. I don’t even remember where I got it. It is most likely off the back of a bag or box of something. I just adjusted it to include the chocolate. 2. In large bowl, beat eggs. Add sugar, butter, corn syrup and salt and mix well. Gently stir in pecans and chocolate chips. 3. Poor mixture into a pastry-lined deep dish pie plate. 4. Cover edge of pie crust with a strip of foil to prevent excess browning; remove foil during last 10-15 minutes of baking. 5. Bake pie until set, about 40-50 minutes. Allow to cool before serving. That’s it. The hardest part is waiting on it to bake. It is really good served with vanilla ice cream or fresh whipped cream. I could also provide you with a recipe for the crust. Occasionally — and I do emphasize the “occasionally” — I do make the pie crust from scratch. However, I’m not going to lie. I’m busy. More times than not, I use a prepared crust. I do recommend using the type you roll out and put in your own pie plate. (At least I generally use a pretty pie plate.) I prefer Pillsbury Refrigerated Pie Crust. I can make a pie crust . But why do it when you can buy one already prepared that is good too? I will say for the pie plate I used for the pie pictured, a larger crust would have been better. I didn’t get the edge I would have liked. I like to brush the edges of the crust with melted butter before baking. It’s not necessary, but gives the crust a much better color. Light or dark corn syrup either one is fine. If you look at any the “old school” recipes, many call for dark. I’ve always been told mainly for the color. With the chocolate added to the pie, you don’t have to worry about that. I generally just use which ever is in my pantry. You can use margarine if you’d like, but butter is better. Come on. It’s pie. If you are going to eat a piece of pie any way, might as well go all the way. I am always trying out new recipes and searching for something new to make, so each Tuesday I will share a new recipe. I will share the good, the bad and the ugly, being honest about my successes and failures (there are many of those). I love to make desserts and bake, so it’s fitting I share a dessert today. (I also sometimes need quick and easy and this recipe fits that bill too.) This is the time of the year we are constantly invited to get-togethers, so I use these opportunities to try new recipes and share a few old favorites. It works out well for me. I get to “feed” my joy of making desserts and baking. I don’t do it often unless I have somewhere to take my efforts, as hubby is a diabetic (a diabetic with a sweet tooth so I try not to have too many temptations around the house) and I really don’t need the calories. Today, I am sharing a recipe that was new to me. 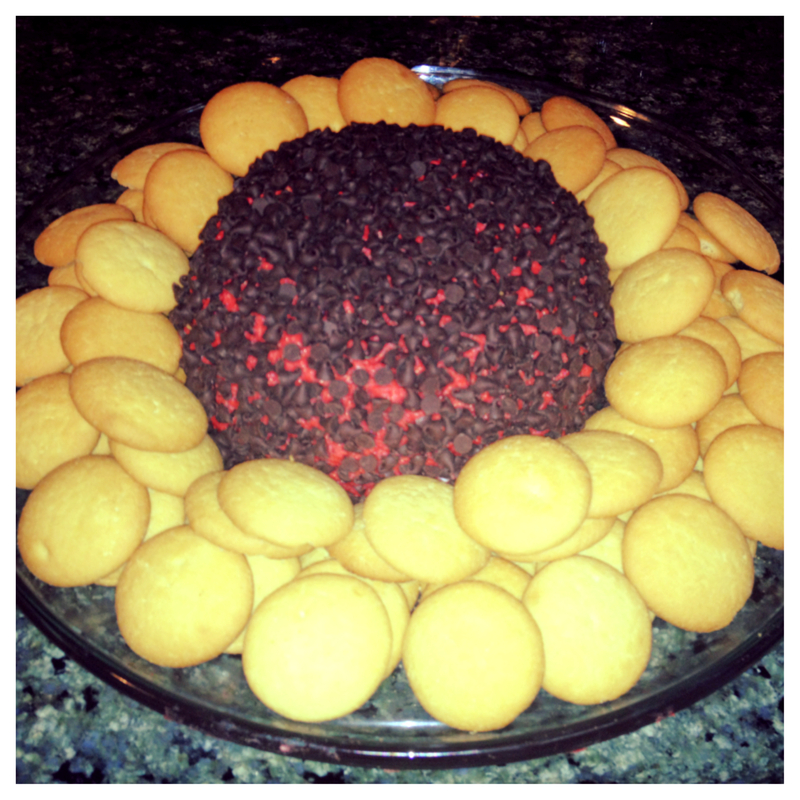 I prepared this Red Velvet Cheesecake Ball for a little get-together with several friends I had not seen in a while. It was a hit, so I know I will definitely prepare this one again! In fact, I’ve already promised my daughter one when she is home from school in a couple of weeks. Red Velvet cupcakes are her fave, so I know she will like this. I also acquired a new dip recipe that night that I will share with you soon. It was quite yummy. It was a great night of good food, friends and wine. I found this recipe on a Facebook page – $5-10 Meals – Cheap Eats. This site fills another need – CHEAP – and I have found several good recipes here. Check it out. I will tell you, I often “tweak” recipes and am not known for always following a recipe to the tee, so I will make note of any changes I’ve made. Added ingredients will be marked in bold. Sorry about the quality of this picture. In the bowl of a stand mixer, beat the cream cheese, vanilla and butter until smooth. Add in the red velvet cake mix, brown sugar and powdered sugar. Beat until smooth and combined. Turn the mixture out onto a piece of plastic wrap. Wrap up into a ball and refrigerate for at least 2 hours. Put the chocolate chips on a plate or in a shallow dish. Remove the cheese ball from the refrigerator and unwrap. Roll in the chocolate chips. Place on a serving plate and serve with cookies. I added the vanilla because this recipe made me think of an icebox cheesecake recipe my mom always loved. That recipe used vanilla. I love vanilla paired with cream cheese, so I thought it would be a good addition here. I was right. In turn, I added a couple of extra tablespoons of powdered sugar to make up for the added liquid of the vanilla. To aid in the shaping of the “ball,” I place the wrapped mixture in a small bowl with a very rounded bottom. Here’s where I failed slightly. It was a busy week and I was running behind as usual. I didn’t allow enough chilling time for the mixture. It was a little soft and hard to “roll” in the chocolate chips. I wound up just patting them onto the surface of the ball. Despite it’s softness, it still tasted great and everyone loved it. Next time, I will make sure I allow at least two hours or more for chilling. All and all, this will definitely be a dish I repeat in the future. It was super easy, inexpensive and tasty. As a bonus, I already had all the ingredients in my pantry. If you try it out, I hope you enjoy. NEXT WEEK: A Pampered Chef favorite.